Kim starting up the first pass, Kongma La, above Chukhung while starting the 3 Passes tour. The decision was made, we’d go. Committing to the run meant having the bare minimum of gear. 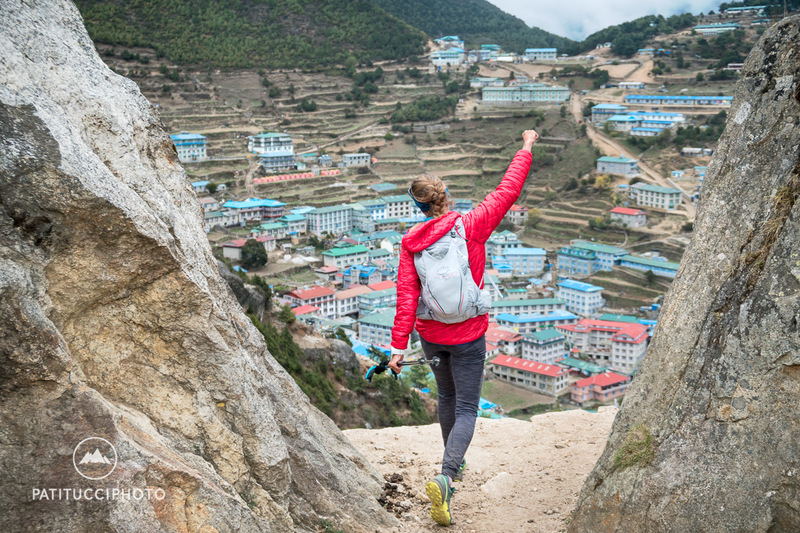 We sent a porter down to Namche with our extras leaving us with 15 liter running packs filled with food, water, rain shells, an extra insulation layer, and a camera. Going light would be key, especially in our condition. My strategy was to consume a lot of calories throughout the day. Meanwhile, Kim would be relying on her tremendous psyche, which on any given day can exhaust dozens of people. As we prepared to go, I remained nervous about my back, and whatever was going on. I felt like I was the wild card. If my legs did what they did getting to Chukhung, I was in trouble. Leaving Chukhung to begin the 3 Passes tour. On May 17, we left Chukhung and started up Kongma La under a warm sun and plenty of blue sky. In the first two hours, we spent more time making photos than progress. 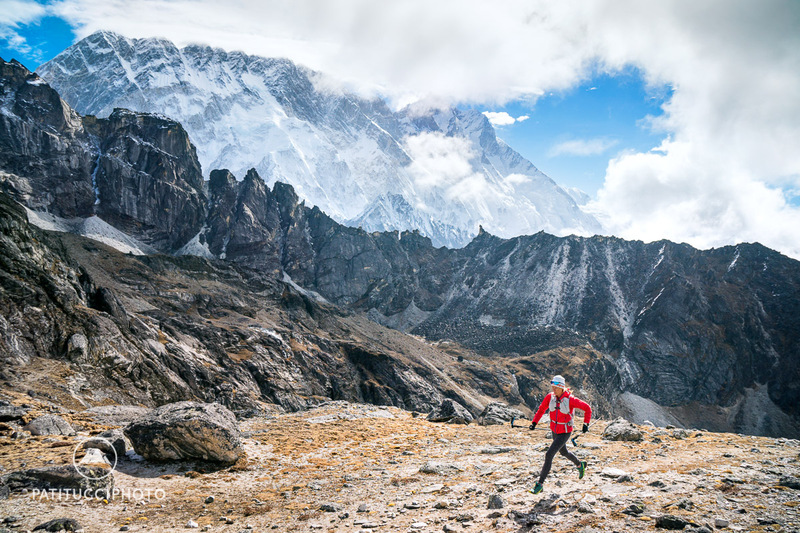 We’d found ourselves in a stunning Himalayan landscape doing what we love, and feeling great. 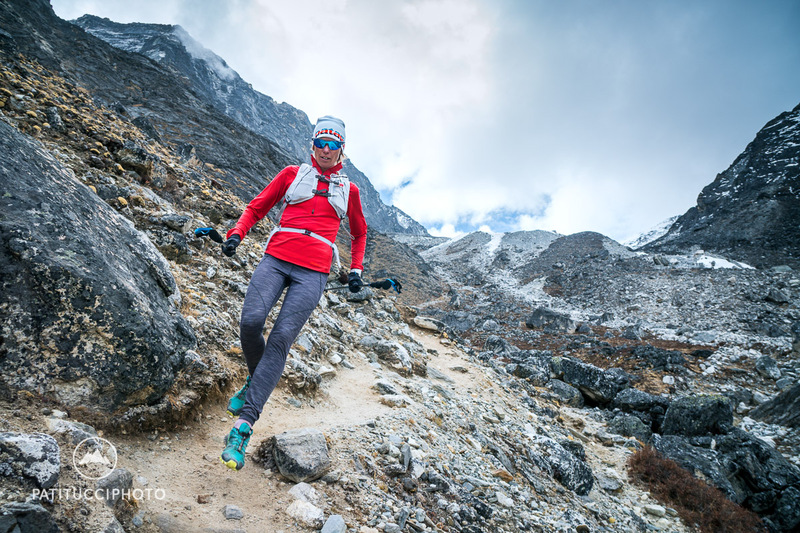 On that first climb, dreamy singletrack leads to the pass while Nuptse, Lhotse (8516 meters), and Ama Dablam keep you impressed. 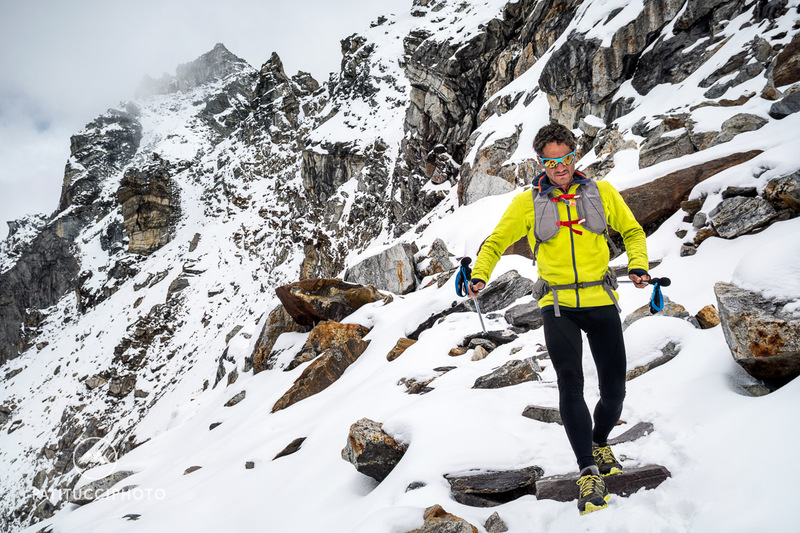 Immediately upon reaching the pass, I devoured a full pizza I had had custom built at the lodge, and watched threatening clouds rapidly build over distant Cho La pass, our next goal. We’d cruised Kongma La and felt perfect, spirits were high, and our bellies were full of pizza and Oreos. Down we went to Lobuche. On Kongma La with Nuptse behind. 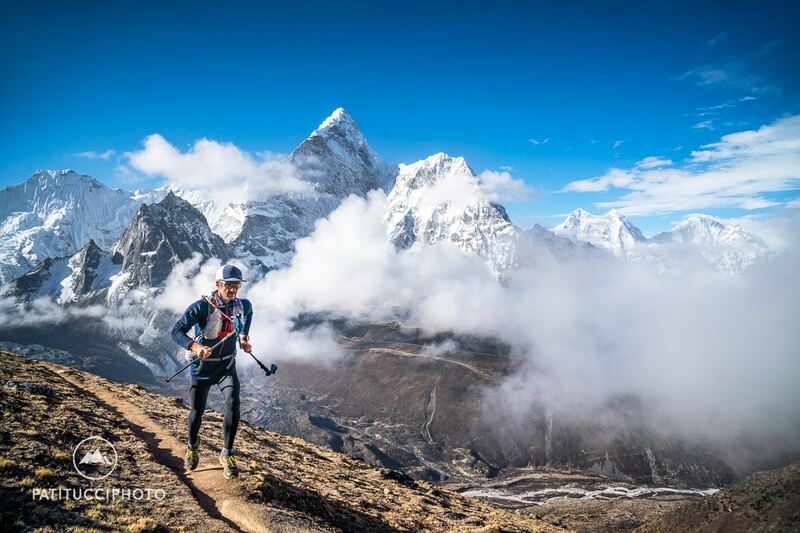 Dan on Kongma La’s perfect single track, Ama Dablam behind. 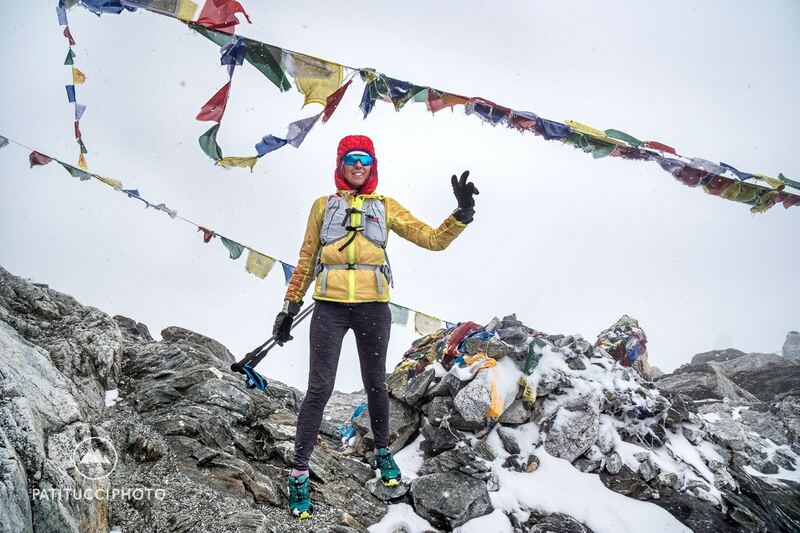 The last meters to the top of Kongma La, 5550 meters. Running only happened on the flats, and then, just barely. Kim feeling good on Kongma La. One down, two two go. Psyche level on high. Descending Kongma La. 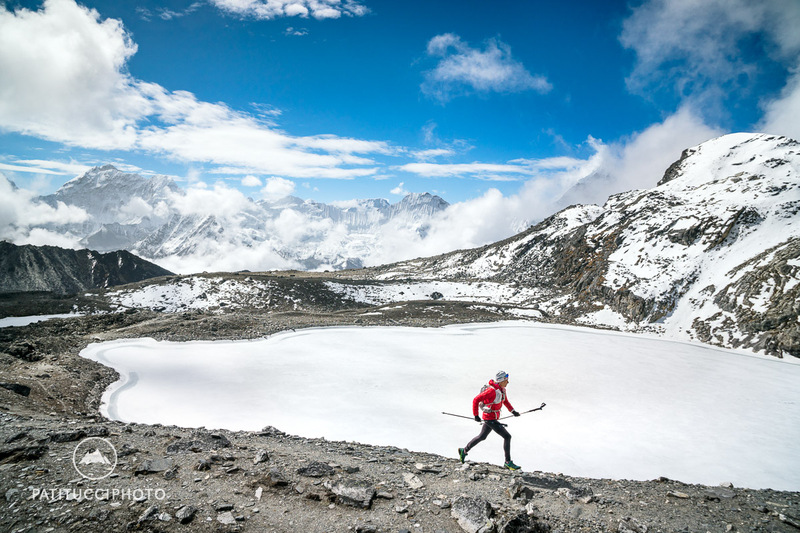 Running at 5000 meters is much easier downhill. After descending Kongma La there is a nasty rock glacier to cross. And you realize there is a long, long way to go. By the time we reached Dzongla, at the foot of Cho La Pass, it was snowing heavily. A lone trekker arriving to the lodges reported about 10cm of new snow, poor visibility, and strong winds. Because we’d already been over Cho La the previous week, we knew the route and the tricky passages. After a quick, “Are you okay with this?”, up we went. Sure enough, visibility went to nothing, the snow piled up and the wind blew. But, it was strangely warm and we actually enjoyed the solitude. As we went higher, our progress was slowed by increasingly deep snow and finally a full white out before the glacier. After some delay, we reached the pass, rolled over the top, and began a rapid descent to drier ground. 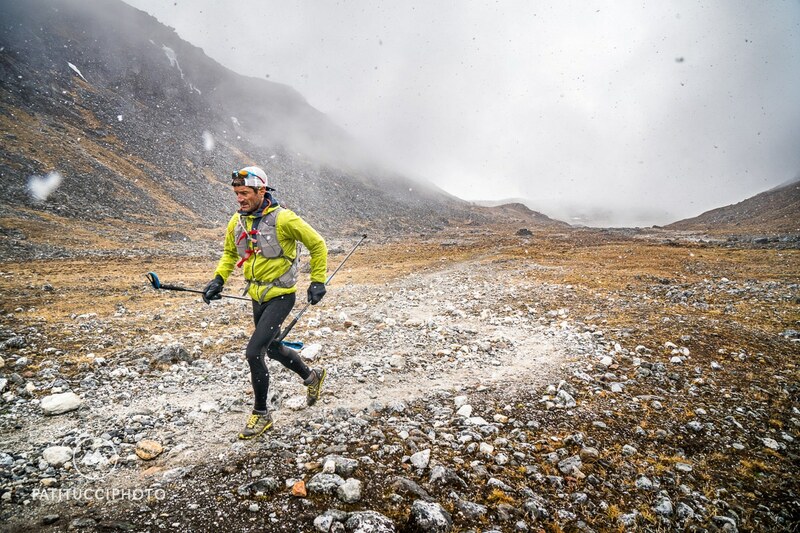 Heading up Cho La in all new weather conditions. 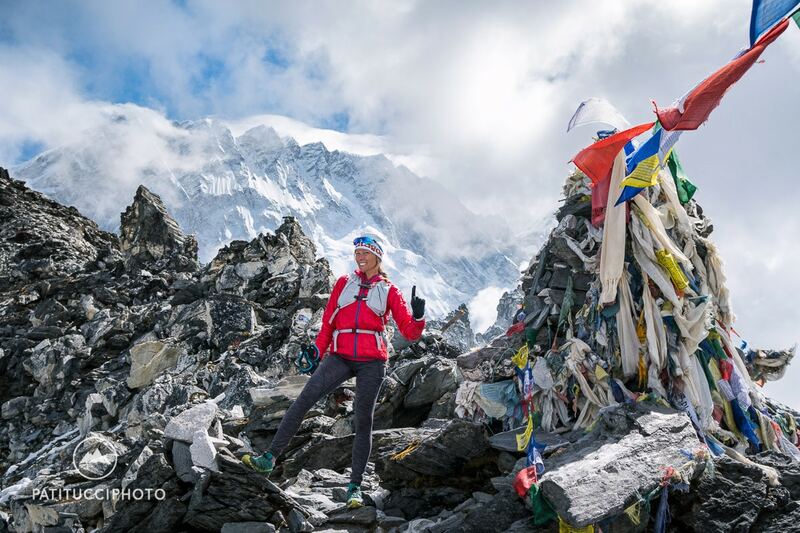 For some reason we had Cho La Pass all to ourselves… thankfully we knew the route from crossing it the week before. Cho La Pass. Two down, one to go. Psyche level holding. 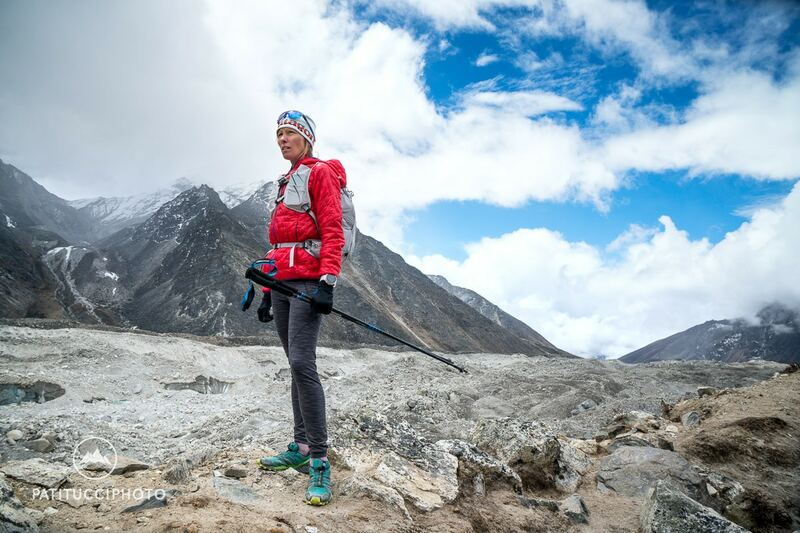 By the time we were in Tangnak, Kim was reporting a headache and absolutely zero ability to breathe through her nose. Her respiratory condition was worsening and her usual energy was nowhere to be seen. 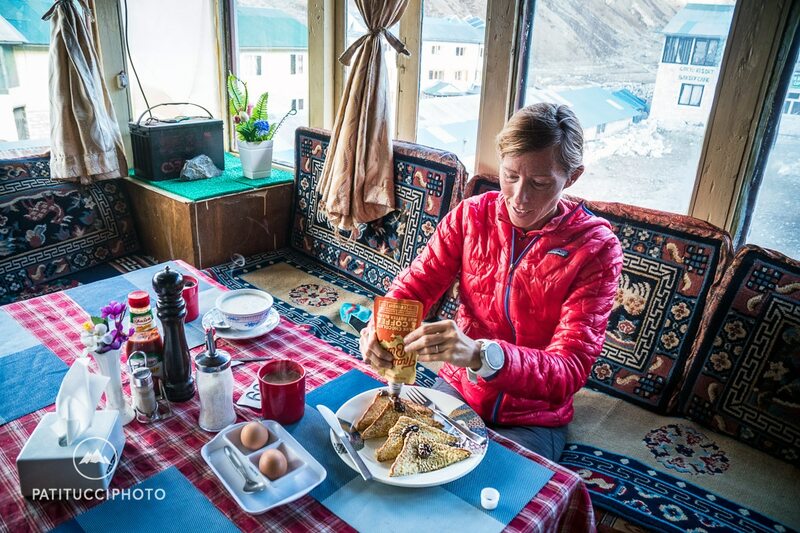 We stopped to get some lemon ginger tea at the Tangnak lodge and inside I watched her struggle with health issues difficult at sea level, horrific at 4600 meters. “Let’s keep going”, she announced. 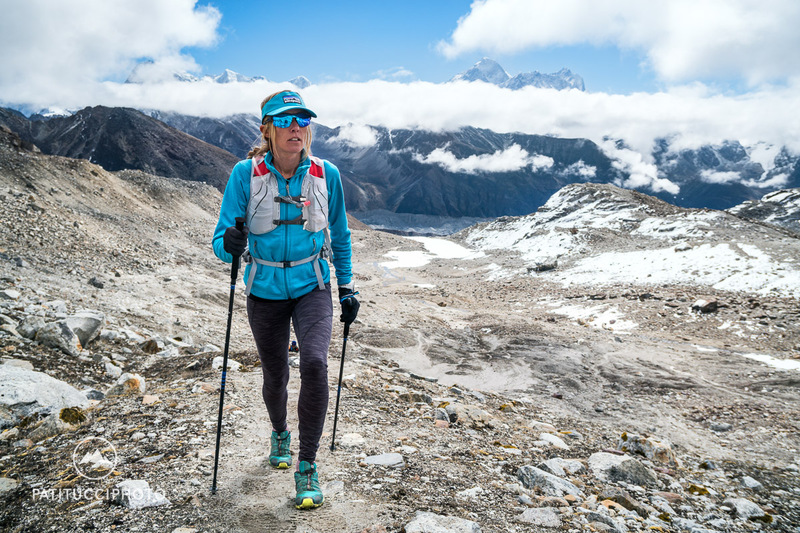 Next up was an hour section of trail to Gokyo, but through an annoying rock glacier full of ups, downs and wrong turns. David had warned us that this section is a mental crux when doing the full 3 Passes. What keeps you going is the promise of decent baked goods at the Gokyo Resort. I focused on the banana bread. But also, on the very real likelihood that we’d stop for an overnight nap in Gokyo. It made sense. We weren’t 100%, Kim’s respiratory condition was worsening, and Renjo La was getting more intimidating with each labored breath. An hour later, instead of making our way up the last pass, we were horizontal, staring at a guesthouse ceiling, wondering if we’d made the right call. I think we did. Instead of waking up in Namche, we woke in Gokyo with another day and one pass ahead of us. But first, French Toast smeared in Trail Butter. The next day proved this true. Kim started the day strong, but after the last pass, Renjo La, spiraled into a place no one wants to be in when such a big effort is required. Her entire body shut down, from breathing to stomach. 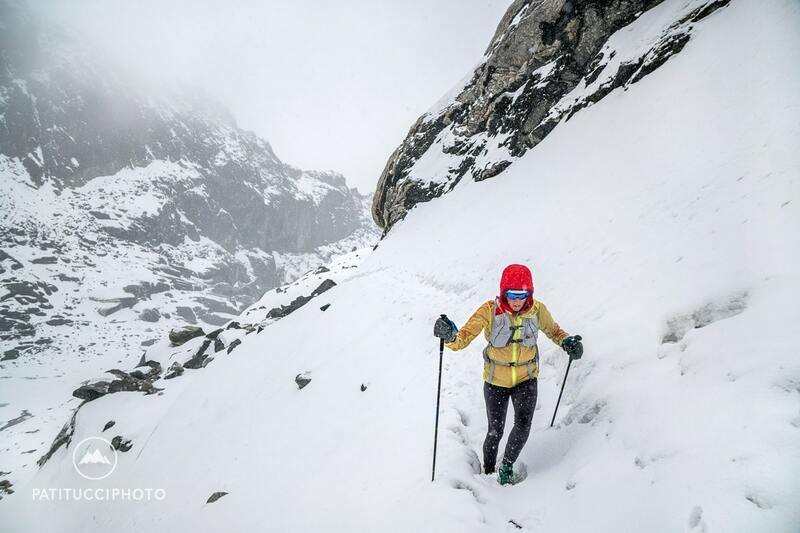 At the foot of Renjo La, with a long 20 kilometers to go, she was facing a tough time. 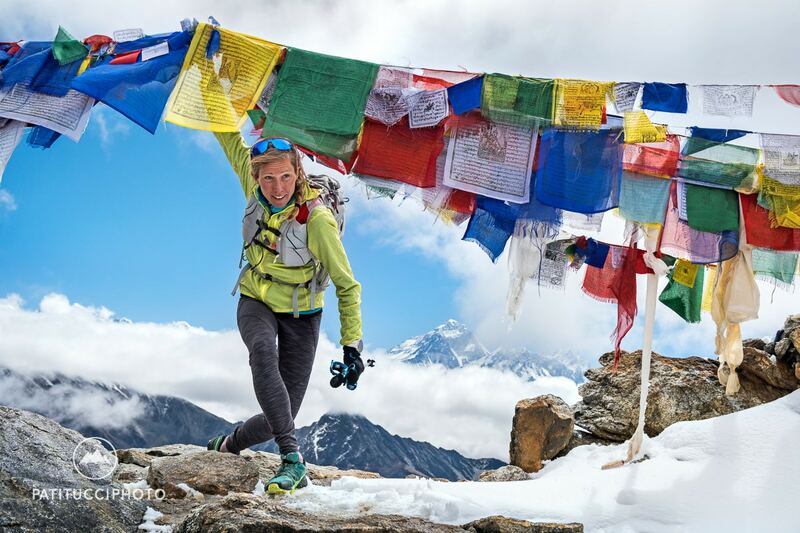 Proudly, she carried on and that afternoon we staggered into Namche, a day later than we would have liked, but together, and appreciating what we’d managed to do with the condition we had. Now, for each of us, we look back with a mix of pride and frustration about how we managed the trip. The inevitable “what ifs” and “if onlys” come up, but it is what it is. And so we learn. We can always go back. And David? He left the same morning as us and pulled into Namche Bazar in an astounding 11 hours and 58 minutes. Walking Renjo La and feeling something’s not quite right. 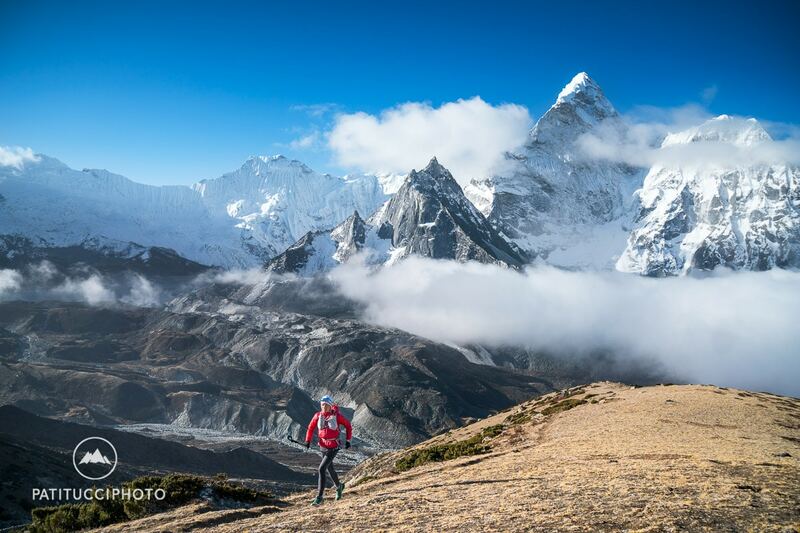 Everest in the distance. Psyche level temporarily on mega while crossing Renjo La, 3 down. Everest behind, a whole lot of down ahead. Descending Renjo La in the remains of the previous day’s weather. How Kim spent the last 20km. 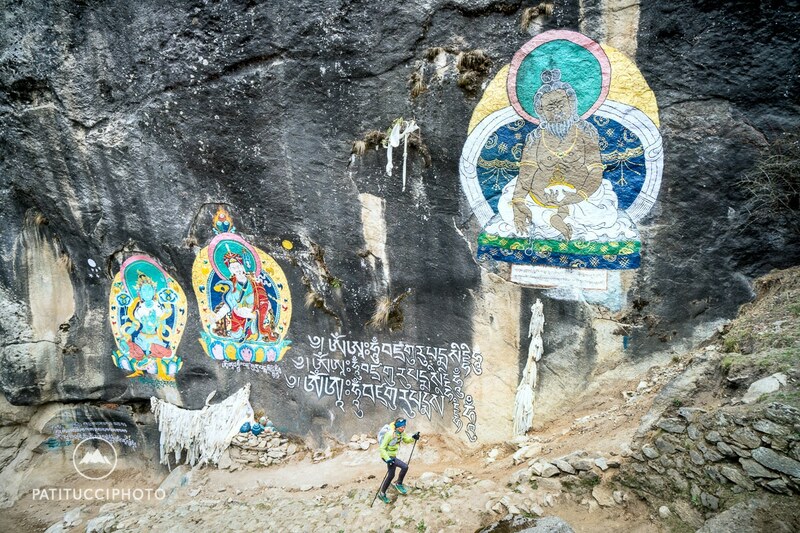 The final kilometers before Namche include some nasty uphills on tired legs, and impressive graffiti. Kim pulling into Namche with a massive, and proud experience behind her. That’s quite an adventure you had there. Excellent writing. I wonder whether doing this project later in June or even in the drier autumn months could have spared you from some of the nasty weather. Also, I’d like to read about the gear choices that you made for this running adventure (may be worth a seperate post?). Hi Ran, Thank you for the kind comment. I also thought about mentioning gear, but the point was… there wasn’t much to even talk about. Running shoes, tights, base layer, mid-layer, puffy (Patagonia Nano-Air Hybrid with a review coming soon…) and shell. 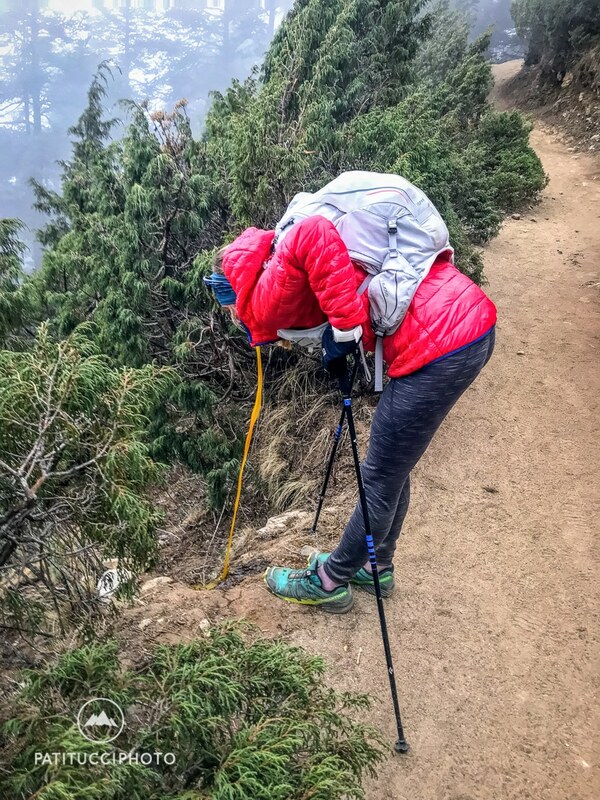 BD carbon poles, Osprey Duro 15 liter pack, BD Stance gloves, camera, food. Not much else! 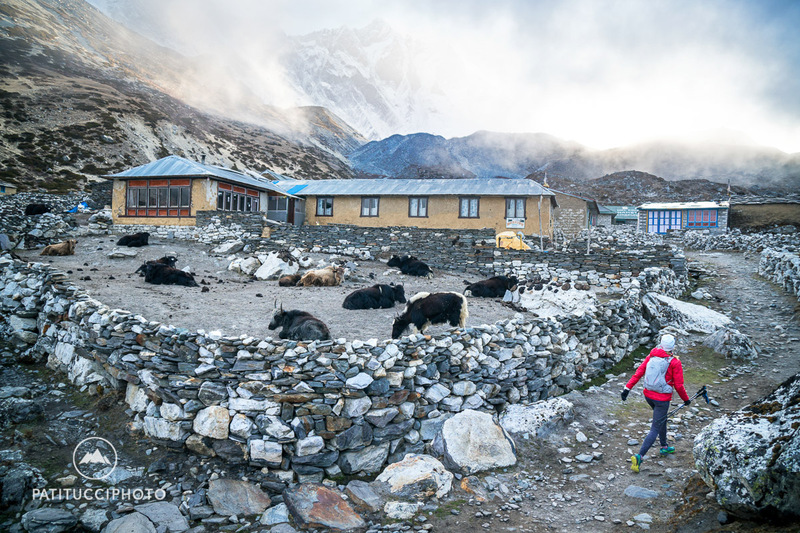 I have spent a lot of time in the Khumbu on previous trips, so I didn’t need or use a guide. We did have a porter we hired in Lukla who was with us until Chukhung, but I went through a friend to find him. I can’t be of much help as it is all set up with Nepali friends. A great guide service is Thamserku, they have managed expeditions I’ve been on and everything was perfect.